Gaming on your … Kindle? I’ve been wondering when Amazon would attempt to integrate gaming into its Kindle ebook devices. Although there were a couple of attempts to make Sudoku for Kindle, it didn’t really work. 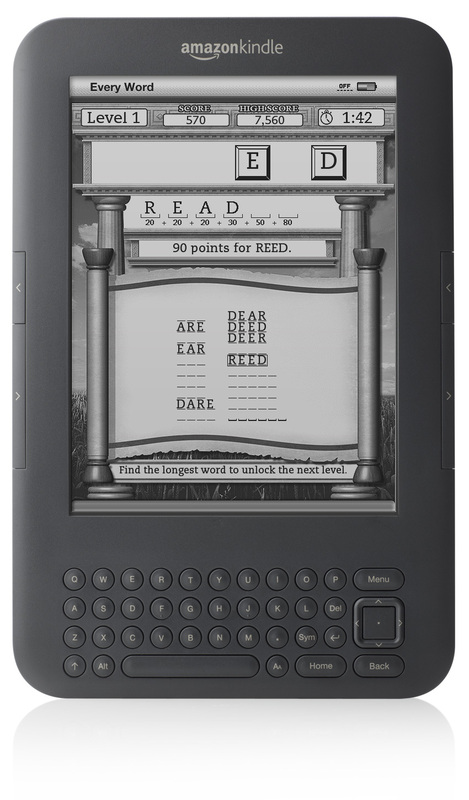 It’s taken a couple of years and hardware upgrades, but we’re finally seeing the first generation of real Kindle games. Well, no one’s going to mistake them for iPhone apps. Between the black-and-white graphics and the lack of touchscreen input, this is a fairly stripped down gaming experience. But that’s not really the point. First, a digression: The daily newspaper is going to die. This is a cold, hard fact of life. I’m not going to make predictions about when, but the death of newsprint is inevitable. (Okay, if pressed, my prediction would be “more than 5 years, less than 10”.) As someone who continues to contribute to newspapers, I’m conflicted about this. Certainly the internet, the 24-hour news cycle, rampant bias, and the death of quality journalism are driving them to extinction, but it’s still hard to see the morning paper simply vanish from the earth. When the newspapers die, however, they will take a couple of key cultural items with them. No, I’m not talking about the news. In the age of the internet, that’s everywhere. I’m talking about meaningful cultural touchstones: the daily comic strip and the puzzle page. Although comic art is one of my passions, we’re not here to discuss that. Puzzles, however, are another matter. The morning crossword is a habit for millions, and the jumbles and Sudoku are solved by even more. Although large compilations of these puzzles are readily available (my publisher, Kappa, puts out about 80 a month), it’s just not the same as sitting down with a fresh paper and a puzzle every day. This is where Kindle and other e-readers come in. If mainstream news has any hope of surviving, it has to adapt not merely to the internet, but to all forms of e-readers and mobile devices. Those devices will need to offer the complete package: news, editorial, local information, ads, printable coupons, comic strips, and interactive puzzles. 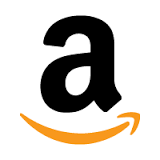 Color isn’t necessary, but a touchscreen is, so Amazon is going to have to work that one at. Some of the competition, such as the nook, already does. This is not optional. A touchscreen, perhaps with a stylus input, would allow them to create e-ink versions of crosswords and Sudoku, allowing people to simply write right on the screen. This will happen: the only question is who will do it first? Both are word games that make the most of the Kindle keyboard and interface. Interestingly, both are also reminiscent of Scrabble Flash. Shuffled Row slowly adds letter tiles to a row. There are enough space for 9 tiles, and a new tile pops up about every 10 seconds, pushing one of the tiles off the row. The goal is to make the longest words you can out of the tiles available to you. 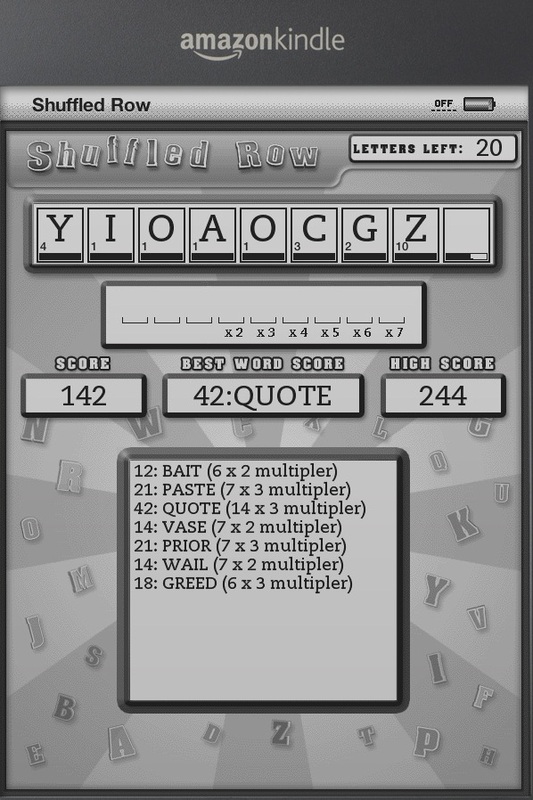 Letters are worth various points, with words longer than 3 letters scoring progressive score multipliers. For instance, a 4 letter word scores x2, while 9 letter words scores x7. Every Word has a similar setup. There are 6 letter tiles in a row, and a number of blank spaces beneath. The blank spaces indicate just how many words can be made from hese letters, and your goal is to find them all. Longer words score more points. There is both a “Relaxed” mode which allows you all the time you need to solve the puzzle, and a “Timed” mode, which doesn’t. These are decent games that play to the Kindle’s strengths. They don’t require a lot of in-game navigation, which would be hard to do with the Kindle controls. Instead, they simply use the keyboard for word input. They’re not going to replace anyone’s existing word games, but they provide an easy diversion that people can carry along with their e-reader. So, rather than reviewing an imitation of a game, I decided to review the game itself, and found that Gaz Thomas had in fact ported Red Remover to the App Store, and done a darn good job of it. Red Remover is your basic physics game. In this case, you’re removing some boxes from the screen while leaving other behind. Different kinds of boxes follow different rules. Red boxes must be removed by clicking; blue boxes can be removed by clicking, but can also be left behind; and green boxes must be left behind. This creates some very challenging situations very quickly. The goal is to remove some objects while leaving others in place. Box removal games are a staple of the app store and flash gaming for a good reason: they make for entertaining, frequently challenging puzzle play. Some of the puzzles in Red Remover require timing, and some just a logical progression of moves. 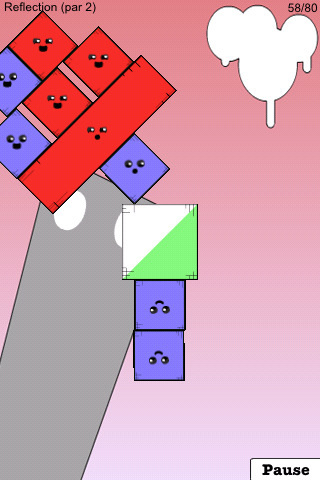 The app store is full of games that follow similar patterns, such as Tiki Totems, Tumble Blocks, and Doodle Blocks, not to mention direct rip-offs like Flubby Physics and Red Block Remover. (These last two actually steal some levels straight from Red Remover.) Red Remover does the job very well, and it keeps the elements simple and the puzzles extremely complex. The is just good abstract physics puzzling. Gaz Thomas tells me that he has a Halloween version of the Red Remover coming out in a week or so. This one will feature new levels and the addition of fireballs.